Since the landmark, monumental work 100–Foot–Long Piece (1969), which can be seen as the painter’s compilation of pictorial vocabulary—one that in alphabetical order is always ready to be realized by his generative experiments with materials and techniques—Joe Zucker has been deemed not only a master of grid-based painting, but a fearless explorer of materials of all sorts. Joe Zucker, “Untitled (Mop Painting),” 2013. Cotton, wood, acrylic, 78 x 78″. Courtesy of the artist and Mary Boone Gallery. 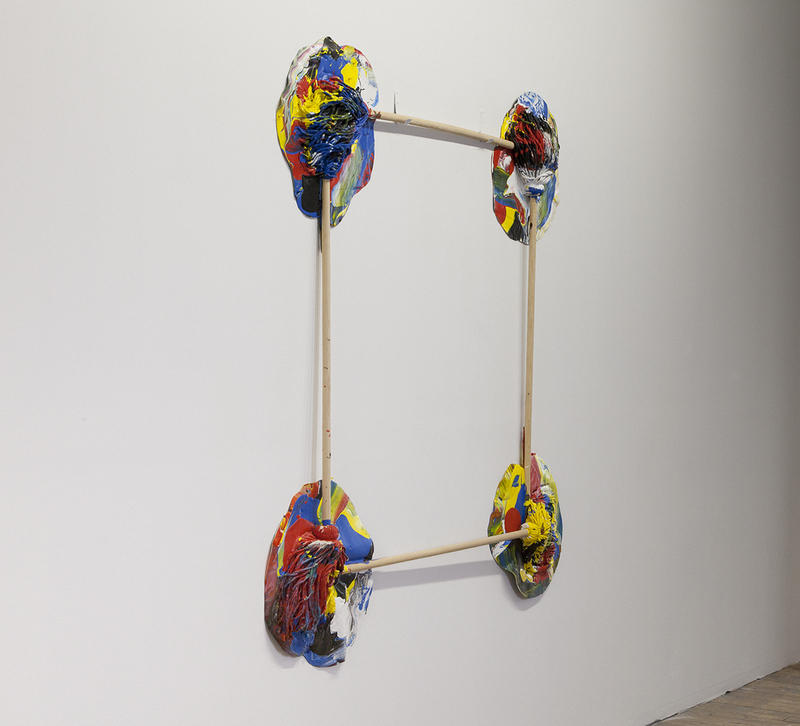 Untitled (Mop Painting) (2013) exemplifies Zucker’s treatment of a collision of a three-dimensional object and a two-dimensional painting as a procedural action extracted from his vast vocabulary and the medium through which it is executed. The piece is a square composed of four 78-inch cotton yacht mops with wooden handles. After laying the shape flat on the floor, Zucker pours acrylic paint—red, yellow, blue, black and white—on top of the four corners. Once dried, the poured acrylic functions as both an adhesive agent and a painterly form. As a continuation of Zucker’s ongoing investigations—which began with his Lake paintings and evolved over the last 20 years—Untitled (Mop Painting) not only references the painter’s interest in fluidity and boating (he is an avid fly-fisherman), but also the ways in which the viscosity of water relates to the viscosity of paint. Unlike painters whose interest in alchemy refers to ancient, precious knowledge of particular recipes, Zucker embraces a variety of materials. In the context of the aftermath of Hurricane Sandy, Zucker’s Untitled (Mop Painting) evokes both the alchemical control of water in relationship to the paint and the elemental uncontrollability of water as a natural phenomenon. Water can only be mopped up once the disaster is over.